It is on a separate sub-domain. It is actually an instance of RightNow Technologies' Web Experience, so they went the CMS route. We could do this more cheaply. Github's 'pages' (gh-pages) system is a worthy hosting platform for something like a help system. You get to edit page source in markdown (or other simple text format), and with gh-pages built-in templating and site-decoration capability, the end product can be nicely polished. After the initial setup, the people who edit content can be non-technical. Github-pages provides a nice web interface for simple editing of existing pages. Like linkedin, developers can map the resulting help to a domain name. Developers will need to learn gh-pages' underlying technologies - Jekyll and Liquid, but after the initial setup can forget them. That's best completely discussed here on Github's own blog. I hope they overcome that restriction or issue. When we use a SCM as the backing store, we get some nice side effects. Specifically we can merge sets of changes simply. All that preparation work for a release against the 'staging' help set, can be merged atomically to the 'live' branch/fork, With branch within one repo, it's a developer activity. With the fork approach, its possible to complete the merge via Github's web interface - meaning the non-technical help editor could do it. Another nice side effect it the ability to model divergence on specific items. What that means that 'live' and 'staging' could differ on a couple of specific items. That could be as simple as the site title atop each page. The developers would perform the merges in such a way that the divergence was maintained for subsequent merges of 'all'. This though would be better for situations where multiple live sites represent help for different clients. 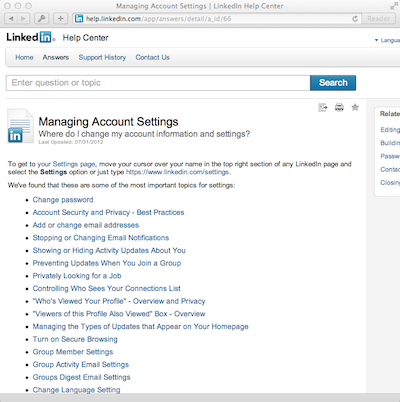 For example a custom "linkedin" instance for IBM, and another for Accenture need not share a help system. With the likes of Knockout or Angular, a rudimentary search system can easily be built into an otherwise static app. What does that look like? Go here and type in the search field (top left). None of that involves a server side interaction It is easy for gh-pages to make the meta-data necessary for that search to work. Github-pages is the hosting (yay Git!). 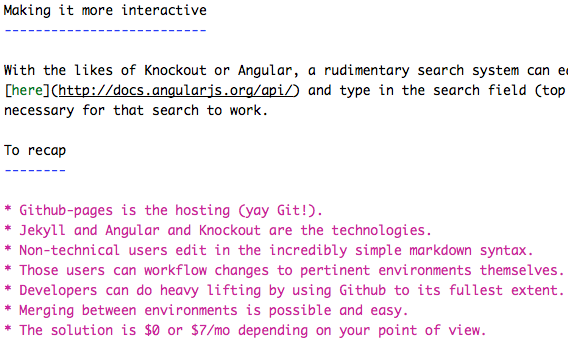 Jekyll and Angular and Knockout are the technologies. Non-technical users edit in the incredibly simple markdown syntax. Those users can workflow changes to pertinent environments themselves. Developers can do heavy lifting by using Github to its fullest extent. Merging between environments is possible and easy. The solution is $0 or $7/mo depending on your point of view.